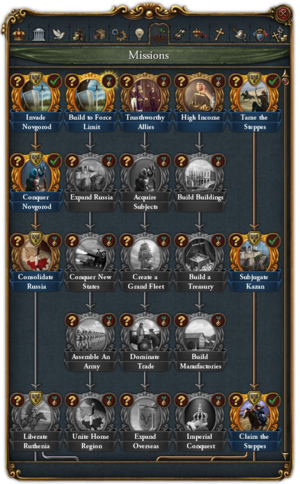 ↑ This mission tree requires Rights of Man expansion. ↑ 2.0 2.1 2.2 2.3 2.4 2.5 2.6 2.7 2.8 This mission tree requires Golden Century immersion pack. ↑ 4.00 4.01 4.02 4.03 4.04 4.05 4.06 4.07 4.08 4.09 4.10 4.11 This mission tree requires Dharma expansion. ↑ 5.0 5.1 5.2 5.3 This mission tree requires Rule Britannia immersion pack. ↑ 7.0 7.1 7.2 7.3 This mission tree requires Third Rome immersion pack. This page was last edited on 21 March 2019, at 16:23.